← Minimum economic contribution of cooperatives BUT humongous political clout! • SENAMHI orange alert determined by the temperature drop in six departments. In three emergency departments it is maintained. Recorded winds speeds between 30 and 70 kph. In areas of the east and south, the temperature will be below zero degrees. The nine departments recorded unusual weather events south and east of the country, so the National Service of Meteorology and Hydrology (Senamhi) determined to issue an orange alert for the entry of the cold front, which will cause the drop in temperature in six departments . In three, emergency status was prepared for possible high winds. The cold front began Sunday 28th and will last until the 31st; also it causes the drop in temperatures even below zero degrees, according to the forecast. Almost all the provinces of the six mentioned departments will be affected. 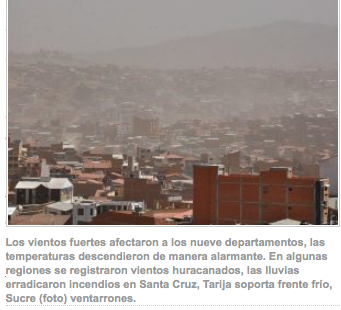 The second alert expected winds 30 to 70 kph will be recorded and will affect until Monday to most of the regions of La Paz, Oruro, Potosi and Cochabamba. On the other hand, despite the declaration of orange alert, the rains in recent days in Santa Cruz eradicated forest fires and improved air quality. According to the Governorate, heat sources dropped to zero throughout the department, according to radio dispatches. This entry was posted in Bolivia, Business, Economics, Environment, Health, Mining, Politics, Social Unrest and tagged environmental damage, fire and smoke, government failures, public policy failures, uncontrolled fires. Bookmark the permalink.